38 ✓ Electrochemical demineralization used in point-of- entry devices to remove hardness ions and other dissolved solids through electrochemical means. ✓ Capacitive deionization, which is an electrostatic process that removes hardness and other compounds. ✓ Electrically induced precipitation that uses a direct electrical current to precipitate water hardness and other compounds. Alkalizer/ionizer These systems are relatively new, with sparse and potentially inconclusive studies verifying claims, and you'll have a difficult time finding peer-reviewed medical literature and national standards regarding the health effects of alka- line water. Be sure to thoroughly review claims that are made. Performance of carbon or reverse osmosis features can be tested and certified, but health effects of alkaline water can't be tested and certified to national stan- dards. So, be cautious if there isn't robust sci- ence backing up claims. 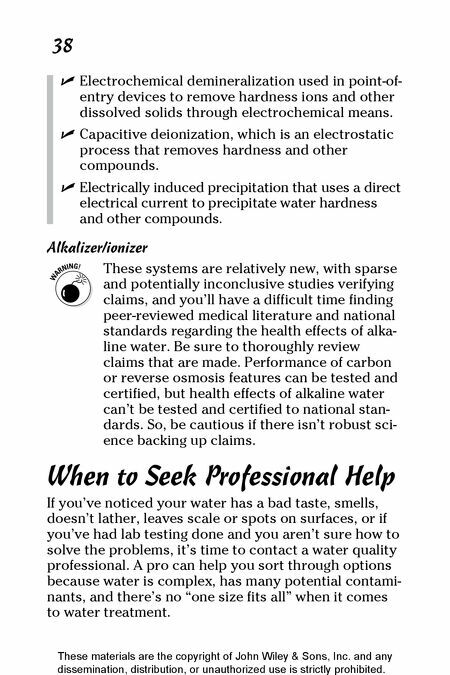 When to Seek Professional Help If you've noticed your water has a bad taste, smells, doesn't lather, leaves scale or spots on surfaces, or if you've had lab testing done and you aren't sure how to solve the problems, it's time to contact a water quality professional. 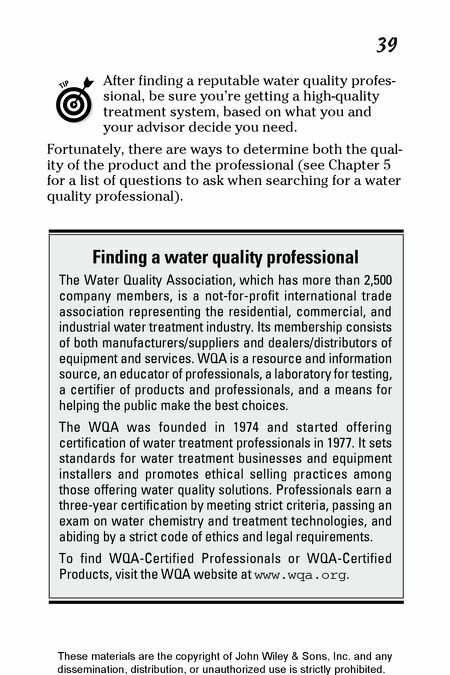 A pro can help you sort through options because water is complex, has many potential contami- nants, and there's no "one size fits all" when it comes to water treatment. These materials are the copyright of John Wiley & Sons, Inc. and any dissemination, distribution, or unauthorized use is strictly prohibited. Chapter 1: What Is Water, Anyway? Chapter 3: What's in Your Water? Is My Water Hard or Soft? Is My Water pH Neutral?